The Prince of Wales and The Duchess of Cornwall arrived in Muscat today for the Royal tour of Oman, the first stop on a week-long tour which also includes visits to the United Arab Emirates and Bahrain. Their Royal Highnesses's visit, which is at the request of the British Government, will promote the U.K.'s partnership in the region in key areas such as religious tolerance, military cooperation, supporting women in leadership, creating youth opportunities, preserving cultural heritage and wildlife conservation. 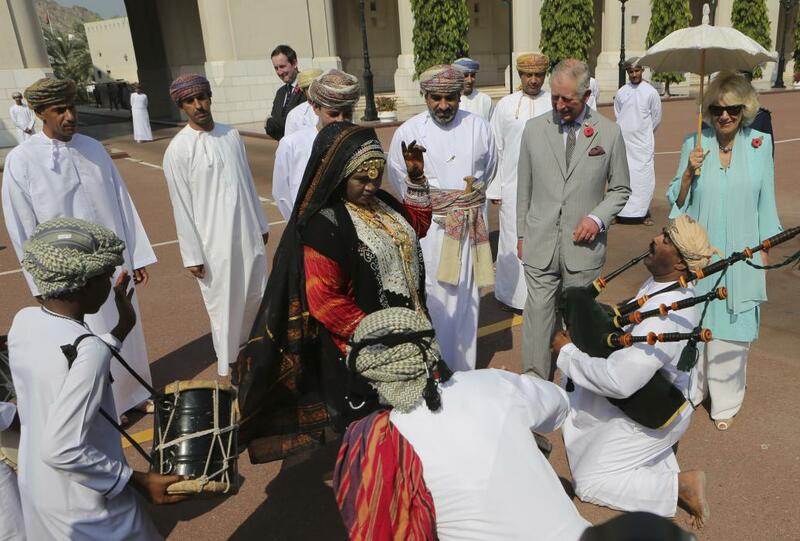 The Prince and The Duchess received a ceremonial welcome in Oman, marking the start of their two-day visit. The ceremony consisted of two dances from different regions of Oman, and took place at the Ceremonial Boulevard in Muscat. His Royal Highness then toured the new National Museum, Oman's flagship cultural institution which showcases the history of the nation from its first human settlement two million years ago through to the present day. 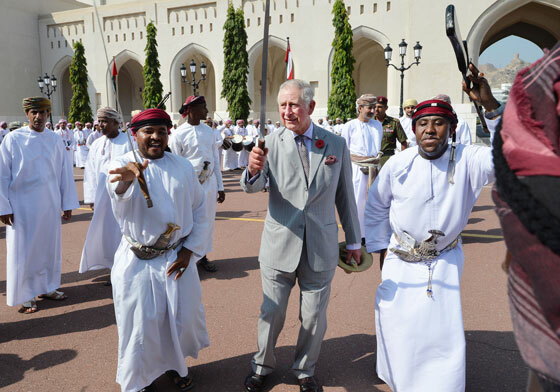 The Prince toured the museum, viewed artefacts and watched a live demonstration of classical Omani poetry. The museum has a number of significant connections with museums in the UK including loans from both The Science Museum and The Victoria and Albert Museum. Meanwhile, The Duchess of Cornwall visited Oman Cancer Association's Dar Al Hanan Hostel, a centre where families affected by cancer can stay together while children undergo treatment. The hostel serves children not only with in Oman but also from other countries such as Yemen, and provides access to both the Royal Hospital and the Sultan Qaboos University Hospital. The Duchess heard how the Oman Cancer Association supports children and their families and met supporters of the important organisation. Her Royal Highness also met Omani female entrepreneurs and women in business at an event to showcase their success in becoming role models to other woman in Oman and highlight their contributions towards the nation. The Duchess talked to Omani businesswoman and heard about how they set up their businesses. Reuniting at Bait Al Noor Church, Their Royal Highnesses attended a service of celebration to mark the 125th anniversary of the final visit to the Sultanate of Oman by the First Bishop of Lahore, Bishop Thomas Valpy French. The service brought together representatives of the Christian community in Oman to remember and celebrate the life of Bishop Thomas Valpy French, as well as the history of the community and its relationship with the Government and the people of Oman. The Prince of Wales then undertook a walking tour of the Misfat Al Abriyeen village. This unique mountainous village is divided into two distinct settlements – the Old and New villages. His Royal Highness toured the Old part, which was built over 200 years ago and is a traditional Omani village, complete with agricultural terraces along the mountain slopes and traditional mud houses built with carved wooden doors, palm frond roofs and solid rock foundations. Accompanied by a local guide and a representative from the Ministry of Tourism, The Prince walked through the narrow pathways of the village and down a hill past an intricate falaj system (the traditional irrigation method) to a restored building which has been turned into a hostel for visitors. To end the afternoon in Oman, His Royal Highness visited the Ras Al Shajar Nature Reserve, which is famous for its rich biodiversity, animals, plants and geological elements. It is home to many rare mammals, notably the Arabian Gazelle, which lives in the coastal part of the sanctuary, as well as the Arabian Tahar, which lives in the rugged mountainous areas of the sanctuary. In the evening, Their Royal Highnesses attended an Official Dinner hosted by His Majesty The Sultan. Tomorrow, The Prince and The Duchess will spend a second day in Oman before travelling to the United Arab Emirates. The final stop on the week-long Royal tour will be Bahrain.